Fabry-Perot interferometer measurements of Doppler shifts in the nightglow 630-nm emission line have been used to determine near-equatorial thermospheric wind velocities at Arequipa, Peru, over ∼2/3 of a solar cycle. Monthly-average nocturnal variations in the meridional and zonal wind components were calculated from the nightly data to remove short term (day-to-day) variability, facilitating display of seasonal changes in the wind patterns, as well as any additional changes introduced by the progression of the solar cycle. The measured seasonal variations in the wind patterns are more pronounced than the solar cycle variations and are more readily understandable in terms of the expected, underlying forcing and damping processes. For most of the years, at the winter solstice, there is a weak (≤100 m/s) transequatorial flow from the summer to the winter hemisphere in the early and the late night, with essentially zero velocities in between. At the equinoxes, an early-night poleward (southward) flow at solar minimum (1986) is replaced by an equatorward (northward) flow at solar maximum (1989–1990). The zonal flows are predominantly eastward throughout the night, except for the solar minimum equinoxes, where brief westward flows appear in the early and the late night. The peak eastward velocities increase toward solar maximum; at the winter solstice, they are ∼100–130 m/s in 1983, 1984 and 1986, reaching ∼200 m/s in 1988, 1989 and 1990. The present equatorial thermospheric wind determinations agree in some respects with the satellite-data-based horizontal wind model HWM-87 and the vector spherical harmonic form of the thermospheric general circulation model. They also are generally consistent with earlier studies at Arecibo, Puerto Rico, and at Kwajalein, Marshall Islands, when compared at similar parts of the solar cycle. 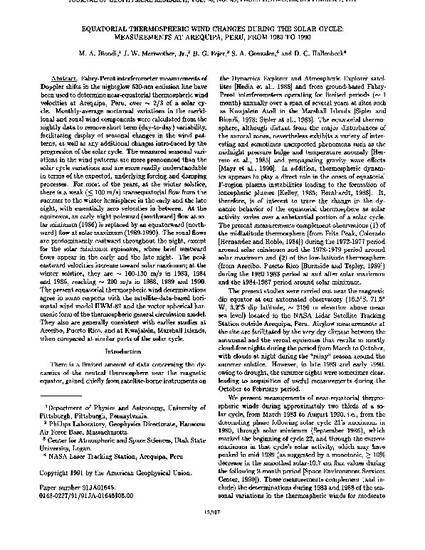 Biondi, M. A., J. W. Meriwether, Jr., B. G. Fejer, S. A. González, and D. C. Hallenbeck, Equatorial thermospheric wind changes during the solar cycle: Measurements at Arequipa, Peru from 1983 to 1990, J. Geophys. Res., 96, 15917, 1991.